Picture taken in a small fishing village Cornwall. 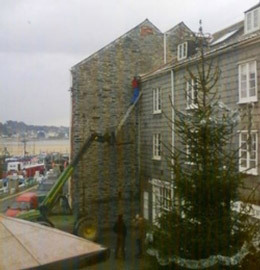 The man looks to be cleaning out his gutters which are around eight metres from the ground.. He has a telehandler with a basket.. excellent you might think, but.. it is an agricultural one with a short boom so he is at least two metres short. He has a ladder as well but alas that is also way to short. The solution? Combine them which he does and with a little stretch here and there he reaches the job at hand. The ladder is not at a good angle the whole thing looks very precarious. One assumes that he managed to do what he set out to do and lived to do it all again. A reader who we have a great deal of respect for here at Vertikal made a comment following our previous death wish which we feel makes some good points. He was hesitant to post it in the comment section, not wishing to draw attention to himself or his company. Essentially he says that when our readers spot such incidents rather than just snapping the offender, they ought to approach them, warn them of the risks they are taking, while offering advice and trying to convert him to a more sane approach. It also needs to be said that the Death Wish series was started to indicate how much of the access market remains to be conquered, as well as highlight poor practice and in some cases name and shame..
We do know that a large number of trainers around the world use the photos in their safety training and that through this the series has had a very positive overall impact since we started it back in early 2008. “While I appreciate that people will take photos of unsafe practices and report them in an effort to highlight such unsafe practices and humiliate those concerned. I have to ask.... the person taking the effort of getting out his/her camera, taking the photo and sending to vetikal.net .... were they really showing their concern for safe practice? ....what action did he/she take to prevent the guy from injuring himself? Why did they not offer to hold the ladder or find someone else to do so? What about their moral duty of care for self and others who may be affected by their acts or omissions? I feel where ever possible we should be actively promoting safe practices and encourage all to offer support and assistance, not just laugh at bad practice or others ignorance. We should be challenging bad practice, have that "difficult conversation" in a calm and sensible manner and hopefully make the guy on the ladder, or the store manager realise the potential dangers and how they can easily be avoided.